ZYLOPRIM is known chemically as 1,5-dihydro-4H-pyrazolo [3,4-d]pyrimidin-4-one. It is a xanthine oxidase inhibitor which is administered orally. Each scored white tablet contains 100 mg allopurinol and the inactive ingredients lactose, magnesium stearate, potato starch, and povidone. Each scored peach tablet contains 300 mg allopurinol and the inactive ingredients corn starch, FD&C Yellow No. 6 Lake, lactose, magnesium stearate, and povidone. Its solubility in water at 37°C is 80.0 mg/dL and is greater in an alkaline solution. 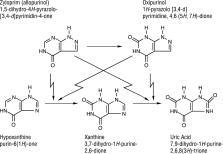 ZYLOPRIM acts on purine catabolism, without disrupting the biosynthesis of purines. It reduces the production of uric acid by inhibiting the biochemical reactions immediately preceding its formation. ZYLOPRIM is a structural analogue of the natural purine base, hypoxanthine. It is an inhiboitor of xanthine oxidase, the enzyme responsible for the conversion of hypoxanthine to xanthine and of xanthine to uric acid, the end product of purine metabolism in man. ZYLOPRIM is metabolized to the corresponding xanthine analogue, oxipurinol (alloxanthine), which also is an inhibitor of xanthine oxidase. It has been shown that reutilization of both hypoxanthine and xanthine for nucleotide and nucleic acid synthesis is markedly enhanced when their oxidations are inhibited by ZYLOPRIM and oxipurinol. This reutilization does not disrupt normal nucleic acid anabolism, however, because feedback inhibition is an integral part of purine biosynthesis. As a result of xanthine oxidase inhibition, the serum concentration of hypoxanthine plus xanthine in patients receiving ZYLOPRIM for treatment of hyperuricemia is usually in the range of 0.3 to 0.4 mg/dL compared to a normal level of approximately 0.15 mg/dL. A maximum of 0.9 mg/dL of these oxypurines has been reported when the serum urate was lowered to less than 2 mg/dL by high doses of ZYLOPRIM. These values are far below the saturation levels at which point their precipitation would be expected to occur (above 7 mg/dL). ZYLOPRIM is approximately 90% absorbed from the gastrointestinal tract. Peak plasma levels generally occur at 1.5 hours and 4.5 hours for ZYLOPRIM and oxipurinol respectively, and after a single oral dose of 300 mg ZYLOPRIM, maximum plasma levels of about 3 mcg/mL of ZYLOPRIM and 6.5 mcg/mL of oxipurinol are produced. Approximately 20% of the ingested ZYLOPRIM is excreted in the feces. Because of its rapid oxidation to oxipurinol and a renal clearance rate approximately that of glomerular filtration rate, ZYLOPRIM has a plasma half-life of about 1 to 2 hours. Oxipurinol, however, has a longer plasma half-life (approximately 15 hours) and therefore effective xanthine oxidase inhibition is maintained over a 24-hour period with single daily doses of ZYLOPRIM. Whereas ZYLOPRIM is cleared essentially by glomerular filtration, oxipurinol is reabsorbed in the kidney tubules in a manner similar to the reabsorption of uric acid. Hyperuricemia may be primary, as in gout, or secondary to diseases such as acute and chronic leukemia, polycythemia vera, multiple myeloma, and psoriasis. It may occur with the use of diuretic agents, during renal dialysis, in the presence of renal damage, during starvation or reducing diets, and in the treatment of neoplastic disease where rapid resolution of tissue masses may occur. Asymptomatic hyperuricemia is not an indication for treatment with ZYLOPRIM (see INDICATIONS AND USAGE). Administration of ZYLOPRIM generally results in a fall in both serum and urinary uric acid within 2 to 3 days. The degree of this decrease can be manipulated almost at will since it is dose-dependent. A week or more of treatment with ZYLOPRIM may be required before its full effects are manifested; likewise, uric acid may return to pretreatment levels slowly (usually after a period of 7 to 10 days following cessation of therapy). This reflects primarily the accumulation and slow clearance of oxipurinol. In some patients a dramatic fall in urinary uric acid excretion may not occur, particularly in those with severe tophaceous gout. It has been postulated that this may be due to the mobilization of urate from tissue deposits as the serum uric acid level begins to fall. The action of ZYLOPRIM differs from that of uricosuric agents, which lower the serum uric acid level by increasing urinary excretion of uric acid. ZYLOPRIM reduces both the serum and urinary uric acid levels by inhibiting the formation of uric acid. The use of ZYLOPRIM to block the formation of urates avoids the hazard of increased renal excretion of uric acid posed by uricosuric drugs. ZYLOPRIM can substantially reduce serum and urinary uric acid levels in previously refractory patients even in the presence of renal damage serious enough to render uricosuric drugs virtually ineffective. Salicylates may be given conjointly for their antirheumatic effect without compromising the action of ZYLOPRIM. This is in contrast to the nullifying effect of salicylates on uricosuric drugs. ZYLOPRIM also inhibits the enzymatic oxidation of mercaptopurine, the sulfur-containing analogue of hypoxanthine, to 6-thiouric acid. This oxidation, which is catalyzed by xanthine oxidase, inactivates mercaptopurine. Hence, the inhibition of such oxidation by ZYLOPRIM may result in as much as a 75% reduction in the therapeutic dose requirement of mercaptopurine when the two compounds are given together. ZYLOPRIM reduces serum and urinary uric acid concentrations. Its use should be individualized for each patient and requires an understanding of its mode of action and pharmacokinetics (see CLINICAL PHARMACOLOGY, CONTRAINDICATIONS, WARNINGS, and PRECAUTIONS). the management of patients with leukemia, lymphoma and malignancies who are receiving cancer therapy which causes elevations of serum and urinary uric acid levels. Treatment with ZYLOPRIM should be discontinued when the potential for overproduction of uric acid is no longer present. 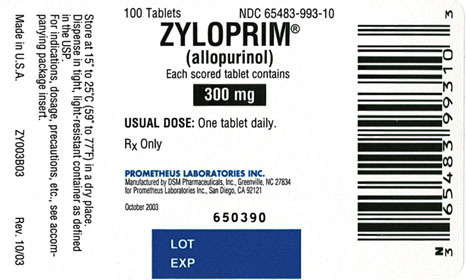 Patients who have developed a severe reaction to ZYLOPRIM should not be restarted on the drug. ZYLOPRIM SHOULD BE DISCONTINUED AT THE FIRST APPEARANCE OF SKIN RASH OR OTHER SIGNS WHICH MAY INDICATE AN ALLERGIC REACTION. In some instances a skin rash may be followed by more severe hypersensitivity reactions such as exfoliative, urticarial, and purpuric lesions, as well as Stevens-Johnson syndrome (erythema multiforme exudativum), and/or generalized vasculitis, irreversible hepatotoxicity, and, on rare occasions, death. In patients receiving PURINETHOL® (mercaptopurine) or IMURAN® (azathioprine), the concomitant administration of 300 to 600 mg of ZYLOPRIM per day will require a reduction in dose to approximately one-third to one-fourth of the usual dose of mercaptopurine or azathioprine. Subsequent adjustment of doses of mercaptopurine or azathioprine should be made on the basis of therapeutic response and the appearance of toxic effects (see CLINICAL PHARMACOLOGY). A few cases of reversible clinical hepatotoxicity have been noted in patients taking ZYLOPRIM, and in some patients, asymptomatic rises in serum alkaline phosphatase or serum transaminase have been observed. If anorexia, weight loss, or pruritus develop in patients on ZYLOPRIM, evaluation of liver function should be part of their diagnostic workup. In patients with pre-existing liver disease, periodic liver function tests are recommended during the early stages of therapy. The occurrence of hypersensitivity reactions to ZYLOPRIM may be increased in patients with decreased renal function receiving thiazides and ZYLOPRIM concurrently. For this reason, in this clinical setting, such combinations should be administered with caution and patients should be observed closely. General: An increase in acute attacks of gout has been reported during the early stages of administration of ZYLOPRIM , even when normal or subnormal serum uric acid levels have been attained. Accordingly, maintenance doses of colchicine generally should be given prophylactically when ZYLOPRIM is begun. In addition, it is recommended that the patient start with a low dose of ZYLOPRIM (100 mg daily) and increase at weekly intervals by 100 mg until a serum uric acid level of 6 mg/dL or less is attained but without exceeding the maximum recommended dose (800 mg per day). The use of colchicine or anti-inflammatory agents may be required to suppress gouty attacks in some cases. The attacks usually become shorter and less severe after several months of therapy. The mobilization of urates from tissue deposits which cause fluctuations in the serum uric acid levels may be a possible explanation for these episodes. Even with adequate therapy with ZYLOPRIM, it may require several months to deplete the uric acid pool sufficiently to achieve control of the acute attacks. A fluid intake sufficient to yield a daily urinary output of at least 2 liters and the maintenance of a neutral or, preferably, slightly alkaline urine are desirable to (1) avoid the theoretical possibility of formation of xanthine calculi under the influence of therapy with ZYLOPRIM and (2) help prevent renal precipitation of urates in patients receiving concomitant uricosuric agents. Some patients with pre-existing renal disease or poor urate clearance have shown a rise in BUN during administration of ZYLOPRIM. Although the mechanism responsible for this has not been established, patients with impaired renal function should be carefully observed during the early stages of administration of ZYLOPRIM and the dosage decreased or the drug withdrawn if increased abnormalities in renal function appear and persist. Renal failure in association with administration of ZYLOPRIM has been observed among patients with hyperuricemia secondary to neoplastic diseases. Concurrent conditions such as multiple myeloma and congestive myocardial disease were present among those patients whose renal dysfunction increased after ZYLOPRIM was begun. Renal failure is also frequently associated with gouty nephropathy and rarely with hypersensitivity reactions associated with ZYLOPRIM. Albuminuria has been observed among patients who developed clinical gout following chronic glomerulonephritis and chronic pyelonephritis. Patients with decreased renal function require lower doses of ZYLOPRIM than those with normal renal function. Lower than recommended doses should be used to initiate therapy in any patients with decreased renal function and they should be observed closely during the early stages of administration of ZYLOPRIM . In patients with severely impaired renal function or decreased urate clearance, the half-life of oxipurinol in the plasma is greatly prolonged. Therefore, a dose of 100 mg per day or 300 mg twice a week, or perhaps less, may be sufficient to maintain adequate xanthine oxidase inhibition to reduce serum urate levels. Bone marrow depression has been reported in patients receiving ZYLOPRIM, most of whom received concomitant drugs with the potential for causing this reaction. This has occurred as early as 6 weeks to as long as 6 years after the initiation of therapy of ZYLOPRIM . Rarely, a patient may develop varying degrees of bone marrow depression, affecting one or more cell lines, while receiving ZYLOPRIM alone. (1) They should be cautioned to discontinue ZYLOPRIM and to consult their physician immediately at the first sign of a skin rash, painful urination, blood in the urine, irritation of the eyes, or swelling of the lips or mouth. (2) They should be reminded to continue drug therapy prescribed for gouty attacks since optimal benefit of ZYLOPRIM may be delayed for 2 to 6 weeks. (3) They should be encouraged to increase fluid intake during therapy to prevent renal stones. (4) If a single dose of ZYLOPRIM is occasionally forgotten, there is no need to double the dose at the next scheduled time. (5) There may be certain risks associated with the concomitant use of ZYLOPRIM and dicumarol, sulfinpyrazone, mercaptopurine, azathioprine, ampicillin, amoxicillin, and thiazide diuretics, and they should follow the instructions of their physician. (6) Due to the occasional occurrence of drowsiness, patients should take precautions when engaging in activities where alertness is mandatory. (7) Patients may wish to take ZYLOPRIM after meals to minimize gastric irritation. ZYLOPRIM and its primary active metabolite, oxipurinol, are eliminated by the kidneys; therefore, changes in renal function have a profound effect on dosage. In patients with decreased renal function or who have concurrent illnesses which can affect renal function such as hypertension and diabetes mellitus, periodic laboratory parameters of renal function, particularly BUN and serum creatinine or creatinine clearance, should be performed and the patient's dosage of ZYLOPRIM reassessed. The prothrombin time should be reassessed periodically in the patients receiving dicumarol who are given ZYLOPRIM. Drug Interactions: In patients receiving PURINETHOL (mercaptopurine) or IMURAN (azathioprine), the concomitant administration of 300 to 600 mg of ZYLOPRIM per day will require a reduction in dose to approximately one third to one fourth of the usual dose of mercaptopurine or azathioprine. Subsequent adjustment of doses of mercaptopurine or azathioprine should be made on the basis of therapeutic response and the appearance of toxic effects (see CLINICAL PHARMACOLOGY). It has been reported that ZYLOPRIM prolongs the half-life of the anticoagulant, dicumarol. The clinical basis of this drug interaction has not been established but should be noted when ZYLOPRIM is given to patients already on dicumarol therapy. Since the excretion of oxipurinol is similar to that of urate, uricosuric agents, which increase the excretion of urate, are also likely to increase the excretion of oxipurinol and thus lower the degree of inhibition of xanthine oxidase. The concomitant administration of uricosuric agents and ZYLOPRIM has been associated with a decrease in the excretion of oxypurines (hypoxanthine and xanthine) and an increase in urinary uric acid excretion compared with that observed with ZYLOPRIM alone. Although clinical evidence to date has not demonstrated renal precipitation of oxypurines in patients either on ZYLOPRIM alone or in combination with uricosuric agents, the possibility should be kept in mind. The reports that the concomitant use of ZYLOPRIM and thiazide diuretics may contribute to the enhancement of allopurinol toxicity in some patients have been reviewed in an attempt to establish a cause-and-effect relationship and a mechanism of causation. Review of these case reports indicates that the patients were mainly receiving thiazide diuretics for hypertension and that tests to rule out decreased renal function secondary to hypertensive nephropathy were not often performed. In those patients in whom renal insufficiency was documented, however, the recommendation to lower the dose of ZYLOPRIM was not followed. Although a causal mechanism and a cause-and-effect relationship have not been established, current evidence suggests that renal function should be monitored in patients on thiazide diuretics and ZYLOPRIM even in the absence of renal failure, and dosage levels should be even more conservatively adjusted in those patients on such combined therapy if diminished renal function is detected. An increase in the frequency of skin rash has been reported among patients receiving ampicillin or amoxicillin concurrently with ZYLOPRIM compared to patients who are not receiving both drugs. The cause of the reported association has not been established. Enhanced bone marrow suppression by cyclophosphamide and other cytotoxic agents has been reported among patients with neoplastic disease, except leukemia, in the presence of ZYLOPRIM. However, in a well-controlled study of patients with lymphoma on combination therapy, ZYLOPRIM did not increase the marrow toxicity of patients treated with cyclophosphamide, doxorubicin, bleomycin, procarbazine, and/or mechlorethamine. Chlorpropamide's plasma half-life may be prolonged by ZYLOPRIM, since ZYLOPRIM and chlorpropamide may compete for excretion in the renal tubule. The risk of hypoglycemia secondary to this mechanism may be increased if ZYLOPRIM and chlorpropamide are given concomitantly in the presence of renal insufficiency. Rare reports indicate that cyclosporine levels may be increased during concomitant treatment with ZYLOPRIM. Monitoring of cyclosporine levels and possible adjustment of cyclosporine dosage should be considered when these drugs are co-administered. Drug/Laboratory Test Interactions: ZYLOPRIM is not known to alter the accuracy of laboratory tests. Experience with ZYLOPRIM during human pregnancy has been limited partly because women of reproductive age rarely require treatment with ZYLOPRIM. There are two unpublished reports and one published paper of women giving birth to normal offspring after receiving ZYLOPRIM during pregnancy. Nursing Mothers: Allopurinol and oxipurinol have been found in the milk of a mother who was receiving ZYLOPRIM. 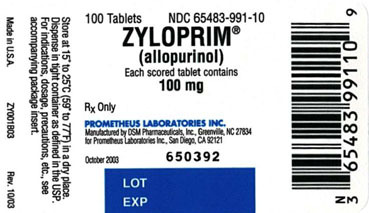 Since the effect of allopurinol on the nursing infant is unknown, caution should be exercised when ZYLOPRIM is administered to a nursing woman. Pediatric Use: ZYLOPRIM is rarely indicated for use in children with the exception of those with hyperuricemia secondary to malignancy or to certain rare inborn errors of purine metabolism (see INDICATIONS AND USAGE and DOSAGE AND ADMINISTRATION). The most frequent adverse reaction to ZYLOPRIM is skin rash. Skin reactions can be severe and sometimes fatal. Therefore, treatment with ZYLOPRIM should be discontinued immediately if a rash develops (see WARNINGS). Some patients with the most severe reaction also had fever, chills, arthralgias, cholestatic jaundice, eosinophilia and mild leukocytosis or leukopenia. Among 55 patients with gout treated with ZYLOPRIM for 3 to 34 months (average greater than 1 year) and followed prospectively, Rundles observed that 3% of patients developed a type of drug reaction which was predominantly a pruritic maculopapular skin eruption, sometimes scaly or exfoliative. However, with current usage, skin reactions have been observed less frequently than 1%. The explanation for this decrease is not obvious. The incidence of skin rash may be increased in the presence of renal insufficiency. The frequency of skin rash among patients receiving ampicillin or amoxicillin concurrently with ZYLOPRIM has been reported to be increased (see PRECAUTIONS). • Gastrointestinal: Diarrhea, nausea, alkaline phosphatase increase, SGOT/SGPT increase. • Metabolic and Nutritional: Acute attacks of gout. • Skin and Appendages: Rash, maculopapular rash. • *Early clinical studies and incidence rates from early clinical experience with ZYLOPRIM suggested that these adverse reactions were found to occur at a rate of greater than 1%. The most frequent event observed was acute attacks of gout following the initiation of therapy. Analyses of current usage suggest that the incidence of these adverse reactions is now less than 1%. The explanation for this decrease has not been determined, but it may be due to following recommended usage (see ADVERSE REACTIONS introduction, INDICATIONS AND USAGE, PRECAUTIONS, and DOSAGE AND ADMINISTRATION). • Body As a Whole: Ecchymosis, fever, headache. • Cardiovascular: Necrotizing angiitis, vasculitis. • Gastrointestinal: Hepatic necrosis, granulomatous hepatitis, hepatomegaly, hyperbilirubinemia, cholestatic jaundice, vomiting, intermittent abdominal pain, gastritis, dyspepsia. • Hemic and Lymphatic: Thrombocytopenia, eosinophilia, leukocytosis, leukopenia. • Nervous: Peripheral neuropathy, neuritis, paresthesia, somnolence. • Skin and Appendages: Erythema multiforme exudativum (Stevens-Johnson syndrome), toxic epidermal necrolysis (Lyell's syndrome), hypersensitivity vasculitis, purpura, vesicular bullous dermatitis, exfoliative dermatitis, eczematoid dermatitis, pruritus, urticaria, alopecia, onycholysis, lichen planus. • Special Senses: Taste loss/perversion. • Urogenital: Renal failure, uremia (see PRECAUTIONS). • Body As a Whole: Malaise. • Cardiovascular: Pericarditis, peripheral vascular disease, thrombophlebitis, bradycardia, vasodilation. • Endocrine: Infertility (male), hypercalcemia, gynecomastia (male). • Gastrointestinal: Hemorrhagic pancreatitis, gastrointestinal bleeding, stomatitis, salivary gland swelling, hyperlipidemia, tongue edema, anorexia. • Hemic and Lymphatic: Aplastic anemia, agranulocytosis, eosinophilic fibrohistiocytic lesion of bone marrow, pancytopenia, prothrombin decrease, anemia, hemolytic anemia, reticulocytosis, lymphadenopathy, lymphocytosis. • Nervous: Optic neuritis, confusion, dizziness, vertigo, foot drop, decrease in libido, depression, amnesia, tinnitus, asthenia, insomnia. • Respiratory: Bronchospasm, asthma, pharyngitis, rhinitis. • Skin and Appendages: Furunculosis, facial edema, sweating, skin edema. • Special Senses: Cataracts, macular retinitis, iritis, conjunctivitis, amblyopia. • Urogenital: Nephritis, impotence, primary hematuria, albuminuria. Massive overdosing or acute poisoning by ZYLOPRIM has not been reported. In the management of overdosage there is no specific antidote for ZYLOPRIM. There has been no clinical experience in the management of a patient who has taken massive amounts of ZYLOPRIM. Both ZYLOPRIM and oxipurinol are dialyzable; however, the usefulness of hemodialysis or peritoneal dialysis in the management of an overdose of ZYLOPRIM is unknown. The dosage of ZYLOPRIM to accomplish full control of gout and to lower serum uric acid to normal or near-normal levels varies with the severity of the disease. The average is 200 to 300 mg/day for patients with mild gout and 400 to 600 mg/day for those with moderately severe tophaceous gout. The appropriate dosage may be administered in divided doses or as a single equivalent dose with the 300-mg tablet. Dosage requirements in excess of 300 mg should be administered in divided doses. The minimal effective dosage is 100 to 200 mg daily and the maximal recommended dosage is 800 mg daily. To reduce the possibility of flare-up of acute gouty attacks, it is recommended that the patient start with a low dose of ZYLOPRIM (100 mg daily) and increase at weekly intervals by 100 mg until a serum uric acid level of 6 mg/dL or less is attained but without exceeding the maximal recommended dosage. While adjusting the dosage of ZYLOPRIM in patients who are being treated with colchicine and/or anti-inflammatory agents, it is wise to continue the latter therapy until serum uric acid has been normalized and there has been freedom from acute gouty attacks for several months. In transferring a patient from a uricosuric agent to ZYLOPRIM, the dose of the uricosuric agent should be gradually reduced over a period of several weeks and the dose of ZYLOPRIM gradually increased to the required dose needed to maintain a normal serum uric acid level. It should also be noted that ZYLOPRIM is generally better tolerated if taken following meals. A fluid intake sufficient to yield a daily urinary output of at least 2 liters and the maintenance of a neutral or, preferably, slightly alkaline urine are desirable. Since ZYLOPRIM and its metabolites are primarily eliminated only by the kidney, accumulation of the drug can occur in renal failure, and the dose of ZYLOPRIM should consequently be reduced. With a creatinine clearance of 10 to 20 mL/min, a daily dosage of 200 mg of ZYLOPRIM is suitable. When the creatinine clearance is less than 10 mL/min, the daily dosage should not exceed 100 mg. With extreme renal impairment (creatinine clearance less than 3 mL/min) the interval between doses may also need to be lengthened. The dose of ZYLOPRIM recommended for management of recurrent calcium oxalate stones in hyperuricosuric patients is 200 to 300 mg/day in divided doses or as the single equivalent. This dose may be adjusted up or down depending upon the resultant control of the hyperuricosuria based upon subsequent 24 hour urinary urate determinations. Clinical experience suggests that patients with recurrent calcium oxalate stones may also benefit from dietary changes such as the reduction of animal protein, sodium, refined sugars, oxalate-rich foods, and excessive calcium intake, as well as an increase in oral fluids and dietary fiber. Children, 6 to 10 years of age, with secondary hyperuricemia associated with malignancies may be given 300 mg ZYLOPRIM daily while those under 6 years are generally given 150 mg daily. The response is evaluated after approximately 48 hours of therapy and a dosage adjustment is made if necessary. 100-mg (white) scored, flat cylindrical tablets imprinted with â€œZYLOPRIM 100â€ on a raised hexagon, bottles of 100 (NDC 65483-991-10). 300-mg (peach) scored, flat, cylindrical tablets imprinted with â€œZYLOPRIM 300â€ on a raised hexagon, bottles of 100 (NDC 65483-993-10) and 500 (NDC 65483-993-50).